The Rough Guide for Malaysia describes the Ulu Muda forest reserve as "West Malaysia's unexplored nature reserve with over 500 km² of preserved rainforest". The area has been closed for tourists for years due to the unstable situation along the border to Thailand, but is now fully accessible (at least the area around the Earth Lodge) for visitors, as long as you get a permit with the government . The Kuala Labua forest camp consists of a number of surprisingly well-built concrete bungalows and dorms, with AC power supply between sunset and midnight. 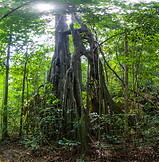 Although claimed to be an "unexplored nature reserve with over 500 km² of preserved rainforest" the reality is that the forest around the Kuala Labua camp (which visitors get to see) is mostly secondary rainforest with only a few patches od primary rainforest. 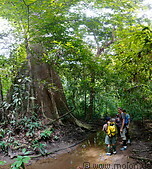 As Hymeir (who is running the Earth lodge) explained, to see primary rainforest you must go much deeper into the reserve. In fact in the past the Ulu Muda reserve has been logged and still does not enjoy full formal government protection against logging.